Once both vessels had anchored, each one placing around 1,100 feet of cable in the water, they were very carefully and slowly manoeuvred alongside each other. Again, the tugs played an integral role in controlling the positioning of these massive ships, as did the pilots and crews aboard the vessels involved. Finally, after several hours, the two ships were safely moored alongside each other, with four large Yokohama fenders between them to prevent damage. Once secured together, each of the anchor cables of the two ships was adjusted to give an even tension, all done to satisfy the rules of the classification societies. This series of photos about the new anchorages in Loch Striven is fascinating thanks for sharing. Brilliant photos as usual too. Great historical set, full of interesting expert knowledge as is usual. Well worth the time at Loch Striven !! "as some 18 more dilapidated hulks"
a rather one sided, uninformed and largely ignorant article there! dilapidated hulks? the maersk beaumont is currenlty around 18 months old having entered into service in early 2008.
the current downturn in economic trade has very little in common with the oil crisis, container shipping is historically the first of the shipping mediums to regain trade after a down turn. fears that these ships will lie in loh striven for years is entirely unfounded. i didnt hear these people complaining when we were bringing the news paper reals and out of season fruits from around the world to their doorstep on this very same vessel! Interesting to read some of your bloggers comments. I wonder how many of then live on Loch Striven and have had their peace and quiet shattered by the noise of generators, the waters around the ship polluted with effluence from the ships as they are cleaned and the night lights beaming in to their windows? Dilapidated hulks yes, but I agree they are not rust buckets as some locals have described them. They are not part of the scenery either and as a local resident I am most upset that we were not given any chance to ask Clyde Port what the implications for us would be. If Jane, John and the rest of the fans would like to come and experience the reality of these ships on the Loch, I wonder if they would feel as enthusiastic. As to the accusation that we enjoy the products from these ships - we don't, my husband and I grow all our own fruit and veg. It's why we chose to live here. Not to stand in our garden and view an international marine dock yard. By the way, "the rather onesided article" was written by my husband who got all his information from Maersk. Go figure. 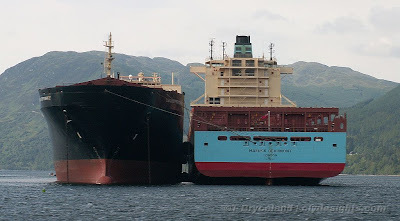 Again i would state the maersk B class are amongst the most modern vessels in the international fleet at the minute. If some one could please inform me as to what a dilapidated hulk is that would be great. to me it is something worn down, or malfunctioning in some way. these ships are not malfunctioning, it is world economies that are malfunctioning thus the lack of work for these vessels. the idea that the information for that article came from maersk is astounding, i would be interested to hear who within the company this information came from. as a long standing employee who has worked on these vessels for many months in varying conditions i take it as an attack on my abilities and the abilities of my fellow seafarers for these vessels to be crimisied in such a way. the same people who critises these vessels will think nothing of parking their car in a street, and why not? they have paid their road tax! they need ask no ones permission. these vessels have paid their harbour and lighthouse dues and, with the exception of the sealand vessel, are british registered ships paying to fly the British flag and are thus in home waters. Not everyone is dependant on the items these vessels bring to the UK, but most are. we are an island, 96% of consumer items purchased in this country are produced outwith it. I live on the isle of bute. they are on my door step. I will refer anyone with concerns over pollution to the MARPOL convention, specifically annex 1, 4, 5 and 6.
i would also reccomend that greenpeace is asked for their opinion on merchant shipping. the last time i was in contact with them on the topic of pollution it was their opinion that more pollution entered our seas from farms, more from road run offs, more oil from natural oil seeps and more from pleasure sailors than from the merchant fleet, and that is individually not as a whole. Is anyone concerned about the job security of the hard working men and women of this country? or are we soley concerned about the view from our front window? tackle the cause rather than complain about the effect. Dear Anonymous. First why are you writing anonymously? and second - we are not complaining about our view being ruined - read my post again - we are complaining about the complete lack of warning, consultation or opportunity to ask Clydeport and Maersk what the impact of this lay up will be. To be perfectly honest, I don't care whether these are brand new hulks or rust buckets (and certainly the Sealand Performance is no beauty) - they are having a serious impact on the health of the closest residents - the noise of the generators is preventing sleep and causing headaches. This is an area of outstanding natural beauty and peace. Whether you are a ship-spotter, an ex-employee or just a fan of shipping I say again: come with a tent and pitch it on the shore where you can really appreciate the noise and waste that is washing up on the shore line. There aren't many of us in the Glen, but not one of the residents is in favour of this lay up. The fans are all visitors who don't have to live here. Don't refer to us as "these people" - we are the few who live with this decision every day. And if you're on Bute, with respect the ships are not on your door step, but presumably you get a great view through your binoculars. I don't need them - the naked eye is just fine. Finally let me just make one thing absolutely clear. Our fight is not with the crew of these ships who I don't doubt are professional and conscientous. Our fight is with the high-handed treatment from Clydeport. Their utter disregard for the residents of Loch Striven is breathtaking. Nowadays you need planning permission to put up a garden shed. There are a number of companies going through protacted planning procedures for windfarms which will at least make a positive contribution to the fight for the environment. Why then can Clydeport get away with a unilateral decision which has a major impact on the residents with ABSOLUTELY NO CONSULTATION AT ALL??? Indeed not only no consultation but in one case complete misrepresentation by a Clydeport employee who passed himself off as a representative from the yachting community in order to gain access to Glenstriven Estate. It is this we object to - not the hardworking seafarers. Please don't misrepresent our objections - it's extremely unhelpful and just clouds an already emotive issue. I appreciate that it would be nice to be asked. But, and good PR aside, is there any reason why Clydeport should ask anyone's permission before utilising any of the water under its responsibility? As a company, it needs to make a profit and this will help secure employment in the area. The opportunity to make money from laying ships up won't last forever, so it's very much the case of making hay while the sun shines. Is it really that objectionable to put up with a slightly different view for a few months? Just out of interest, were similar views raised in the late 1970s when a pair of new gas carriers and a pair of new VLCCs laid up in the Loch? (For those interested in the names, they were Gastor, Nestor, Coastal Corpus Christi, and Coastal Hercules).